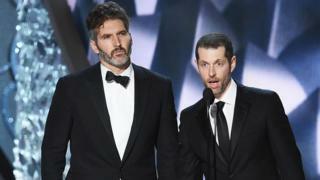 Di creators of di Game of Thrones TV series, David Benioff and DB Weiss don redi to do some series for di Star Wars feem. Di two creators go begin do di Star Wars feem once dem finish work Game of Thrones wey go end for 2019. Dem neva yarn plenty about di new project. Game of Thrones' Sansa don say "yes"
Di tori wey dem act for di new Star Wars series go dey different from di current one and e go also form trilogy wey di director of di 2017 The Last Jedi, Rian Johnson go plan. Inside joint statement, Benioff and Weiss say, "For summer of 1977, we travel go one far galaxy and we don dey dream of ever since". Kathleen Kennedy wey be di president of Lucasfilm, producers of Star Wars say Benioff and Weiss na some of di best storytellers wey dey ground today.